The system consists of 84 Trina 250 watt panels feeding three Sunny Boy 7000 TL-US inverters to provide up to 21 kilowatts of three phase power into the school electrical system, any surplus being exported into the grid. 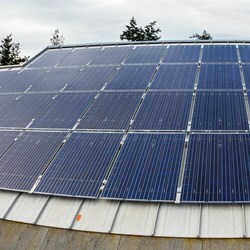 Planning and construction was undertaken by the Salt Spring Island Community Energy Group, overseen and assisted by a NABCEP qualified installer. The Group also fund raised for the project, mainly from local concerned individuals and businesses but also with a significant matching grant from Bullfrog Power. The money saved on electricity used by the school will be used to fund one or more annual Solar Scholarships for graduating students to follow environmental studies or trade qualifications in renewable energy industries.